MCM Training – Week 8 (Trails derailed, time for R.I.C.E) | So What? I run. Well it appears that a tiny tear/muscle strain in my left calf has derailed my training for the week….perhaps two, but I’m feeling optimistic. Yesterday we were supposed to do 6 miles of trail, which I love, but had to skip. As my friend Kevin said to me earlier this week, “Respect the injury.” <sigh> My doctor, physical therapist, and personal trainer all say the same thing…better to miss a couple of runs now then to screw it up and miss out on the marathon down the road. I’m not one to sit on the sidelines quietly. I want to be OUT THERE RUNNING! But, I want to run Marine Corps Marathon more. I’m very, very fortunate to have such a minor injury that it would be stupid of me to push forward and make it worse. So as everyone has been drilling into my head…I have to BE SMART. So, what should you do if you strain or tear a muscle? R.I.C.E. until you can see a doctor. What is R.I.C.E.? REST – Stop using the injured part, and rest it as soon as you realize an injury has taken place. Continued exercise or other activity could cause further, more extensive injury, delay healing, increase pain and stimulate bleeding. ICE – Ice helps stop internal bleeding from injured blood vessels and capillaries. Sudden cold causes small blood vessels to contract. This contraction of blood vessels decreases the amount of blood that can collect around the wound/injury site. The more blood that collects, the longer the healing time. COMPRESSION – Compression decreases swelling by slowing bleeding and limiting the accumulation of blood and plasma near the injury site. Without compression, fluid from adjacent normal tissues seeps into the injury area. The more blood and fluid that accumulate around an injury, the slower the healing. ELEVATION – Elevating the injured part above the level of the heart is another way to decrease swelling and pain at the injury site. Elevate the iced, compressed area in whatever way is most convenient. Prop an injured leg on solid objects or pillows. Elevate an injured arm by lying down and placing pillows under the arm or placing them on the chest with the arm folded across. I may be a little bit of a hypochondriac, but the minute something feels wrong, I’m at the doctor’s office. I figured the sooner something is diagnosed or cleared, the sooner I’m on the road running. On a side note, if you’re training hard, be sure you have an excellent sports doctor and physical therapist in your back pocket. Do your research and get references. I’m fortunate to have two of them who happen to be doctors for the Baltimore Ravens team and I get to catch a glimpse of them on the sidelines during games. I feel that if they are good enough for professional football players, then they’re good enough for me. Next run? Not sure…perhaps the dreadmill tomorrow morning? 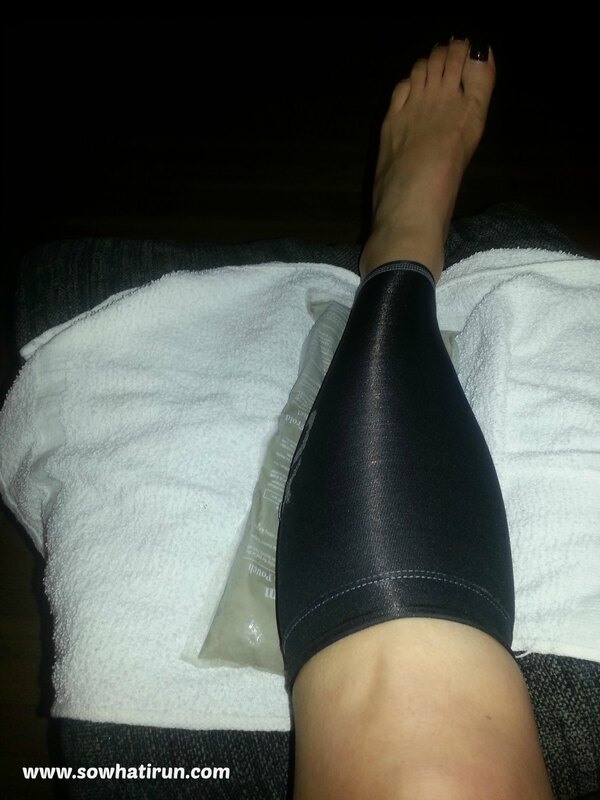 This entry was posted in Marathon Training and tagged compression, elevation, ice, Injury, Marathon Running, marine corps marathon, Physical therapy, rest, RICE, Running by SoWhatIRun. Bookmark the permalink. That stinks about your injury, but way to sacrifice for the bigger picture. Hope you feel back to 100% soon! Definitively. The slow walk/jog that I did on the dreadmill yesterday for 1.25 miles set me back about two days. So disappointed! I will definitely stay off through next week. Thanks for the advise! !